Digital media has completely changed the way people communicate and offers an unprecedented opportunity for brands to reach their customers. 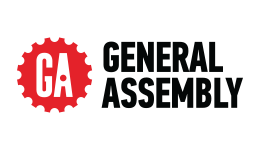 With this Digital Marketing Part-Time course from General Assembly, you can build the skills, experience and insights required to harness those opportunities and create effective and high-impact marketing solutions for a wide variety of organisations. After completing this course, you may choose to seek employment as a digital marketer, marketing assistant, or digital content producer, on take on responsibilities relating to digital campaign and content strategy, digital decision-making and content development.